Are you keeping your LBS alive? Stirling Senior shares his opinion on why local bike shops are so important. I love bicycle retail stores. I go overseas on vacation and I can’t wait to visit a few bike shops. Even if it’s only for the experience of being inside a bike shop. I like bicycles and everything that goes with it so much that when I left my job as publisher of Getaway magazine I opened a bike shop without even intending to open a bike shop. So, I don’t only visit and buy from bike shops I also own one (actually its “we” own a bike shop but I write ‘I’ because these are my personal musings). So, not only do I enjoy bike stores I also work in one – almost six days a week. Our store is a one-brand store. A Specialized Concept Store. Some cycle shops are moving in this one-brand concept store direction (usually driven by the importer/distributor). Pretty much like motor dealers are single brand automotive suppliers. These importers show huge confidence in our economy. Many stores are multi-brand stores. Both models work. For consumers and owners. It is challenging for many bike brands to go the concept store route. The brand has to have a really solid importer with proven track record of consistent and reliable supply. The bike brand has to have depth in models, sizes, price points, colours, accessories, apparel, spares and shoes. Shop identity, advertising, sponsorships, ambassadors and social media platforms are all part of going the Concept Store route. Ultimately, it’s all about the rider experience from shopping to buying to servicing and repairing to riding and everything else in between. Expensive to shop fit and fill up with new bikes and all the extra goodies. The contribution to the South African general economy by the bicycle collective (importation, distribution, retail sales, service and repairs, employment, and YOU, the buyers of bicycles) is huge. 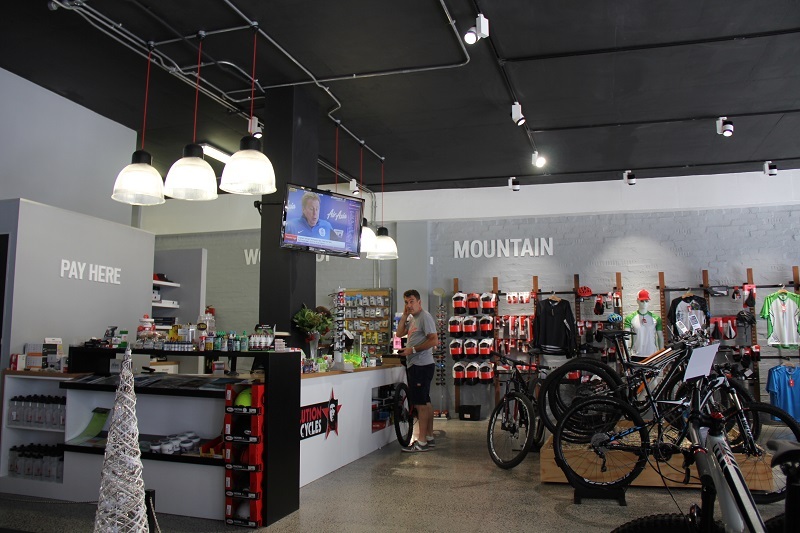 Specifically, each bicycle retailers’ contribution to taxes in the form of VAT, business tax, personal income tax and import duty is a significant part of this contribution to the state’s coffers. More than that, each bike shop employs many people from that part of the unskilled populace that desperately need jobs. We take many unqualified people and give them skills, self-respect and the ability to look after their dependents and to contribute positively to South Africa’s economy. Brick and mortar bicycle stores are the hub of the wheel of the activity of owning and riding a bicycle. The spokes are trails, bike parks, trail builders, races, bike tours, insuring your bike, coaching, bike magazines and websites etc. – all contributing even more to ancillary entrepreneurs and, therefore, to the employment market and the broader economy. I don’t blame you for asking: Cool, but why are you telling me all this? The April/May issue of Full Sus had a news snippet on a “new bike brand” now available in South Africa. Knowing that they are an online bike supplier I decided to visit their website to do some research on their business model. In the simplest of terms, the brand designs and manufactures their bikes in Europe. You log into their online store. You choose what you want. Make payment. They send the bike to you. It arrives. You pay import duty and VAT. 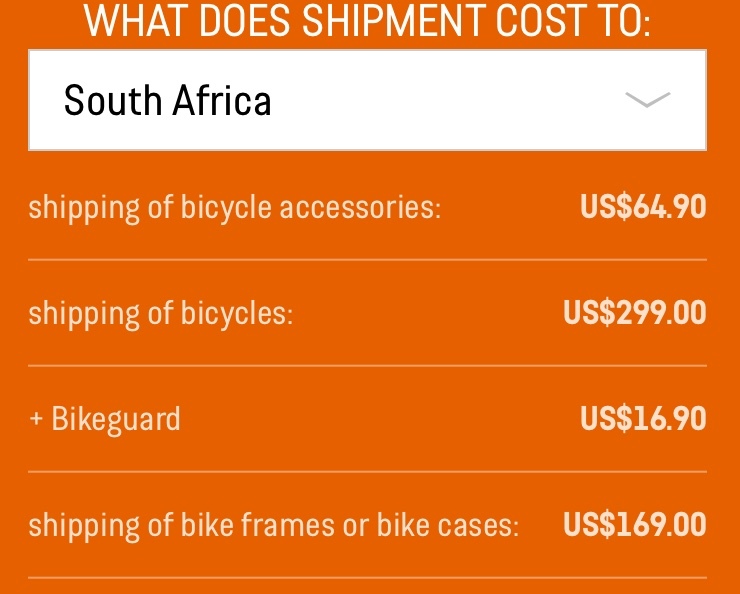 I believe you get my point – buying your bike directly from overseas contributes almost nothing to the retail bike industry in South Africa or to the general economy of your country of residence. Brands like Giant, Santa Cruz, Specialized and many others are invested in our economy and committed to our brick and mortar retail bikes shops. Importers and distributors, along with their preferred retailers, are investing in these brands and in our economy and risking their capital in a volatile economic environment. This does not apply to direct-sales, bike-brand business models in Germany or the USA who can decide tomorrow to no longer sell to South African customers without any repercussions or losses. My advice: if the brand you like does not commit to South Africa, don’t buy it. There is such a huge choice of bikes in our sophisticated bicycle market (arguably the best retail experience in the world) you will find one that will do the job just perfectly. And you’ll be able to talk to someone, get advice, share experiences, bump into your riding buddies and check out all the latest bike products. Better than ticking a few boxes and paying on PayPal.